Begging For Answers? Try This! Teaching a dog to sit up on its haunches, or beg , is one of the best exercises to strengthen a dog's core musculature . The core musculature consists of three groups of paraspinal (back) muscles as well as the lateral and ventral abdominal muscles.This exercise can target each of these groups of muscles separately. This exercise can really pay off in preventing injuries in active dogs! In addition to targeting specific core muscle groups , the sit-up requires no equipment (except delicious treats), can be performed indoors when the weather outside is nasty, and it's non-concussive , so you are not adding more impact to your dog’s already active life. But wait a minute! Maybe you heard that this exercise was not a safe exercise for dogs. The word was that you should NEVER do this exercise with dogs because it would put too much pressure on the articular facets (the joints that connect one vertebra to the next)! ﻿When I heard that rumor, I did what everyone should do, and looked for scientific evidence . I went to the best source of published scientific information, pubmed.com. There I found study that was published way back in 1992 that actually measured the amount of pressure on dogs' articular facets when they are doing the sit-up exercise (1). And guess what? A dog puts MUCH more pressure on its articular facets by just standing still, going up or down stairs or doing the sit-to-stand exercise than when sitting up (see table below). In conclusion, I think we can put any concerns about this exercise being dangerous to rest. Of course, this exercise should not be performed with a dog that has back pain –those dogs need a diagnosis to determine the cause of the pain, which would then be directly addressed In addition, this exercise should not be done with dogs with an active iliopsoas strain as it is likely painful for them. Nonetheless, for any of you that were worried that the sit up exercise was dangerous, welcome to one of the best-ever core exercises ! How do you do it? See below. Willis shows how it’s done! relevant to every veterinary practice and their staff. Teach Your Dog To Sit Up! This is a difficult exercise for many dogs initially, so progress slowly through the stages that make it the exercise gradually more difficult and do not practice any more often than every other day. Read these instructions and progress through them step-by-step, not skipping any. Start with your dog sitting and nibbling treats - always have your dog nibbling treats throughout this exercise. Move the food backward and just a little bit upward to a position where it is over the base of his tail so that your dog’s spine is perpendicular to the floo. Don’t hold the food so high that your dog has to stretch its neck up to reach the food. If your dog moves away or tries to stand up, quickly remove the food (best to put it behind your back) and look away. After a moment, try again. They’ll soon learn they don’t get treats for that. Many dogs are initially too weak to get their front feet off the ground, so give them a treat just for lifting one foot slightly off the ground, then for two feet. 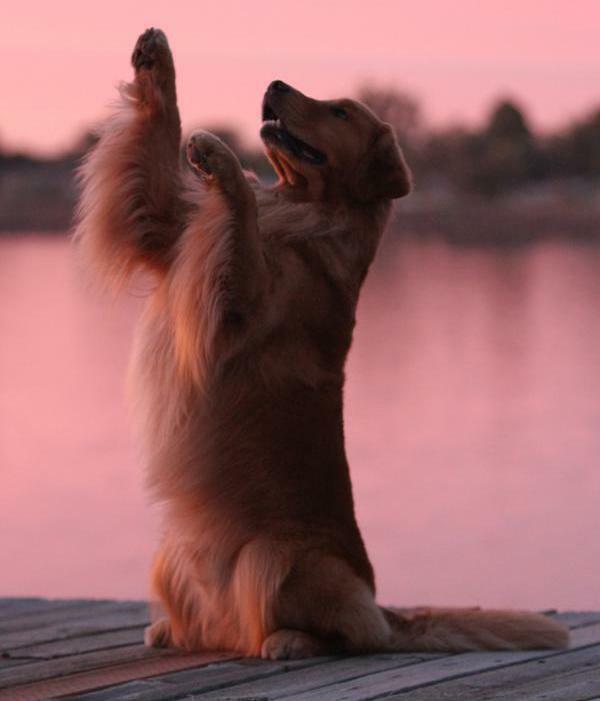 After 7 to 10 days of trying, dogs usually have built up enough muscle to be able to beg with both front feet off the ground. Move the food side to side, back and forth, up and down. Push on your dog’s chest from the sides, front and back. Then progress to hills (facing a different direction each session). The part of the dog’s body that is facing uphill does the most work. Then progress to an egg-shaped physioball (purchase the largest one for every size dog), putting one pointed end against the wall and using your knees to move the other pointed end irregularly from side to side. ﻿Work this exercise only until your dog is panting. If your dog cannot do three 15-second sit-ups, just stop for the day and try again next session. Thank you for continuing to seek out new information that will help you in your life-long journey with your active dog. The bite-size tidbits included in each newsletter are designed to help you keep your canine partner healthy and active well into the senior years. We have lots of newsletters planned for the future, but if there is a topic you would like to see addressed, don’t hesitate to contact us at info@caninesports.com and tell us.